Cardiff Blues finished 2017 as they ended, with a loss against West Wales rivals Scarlets. 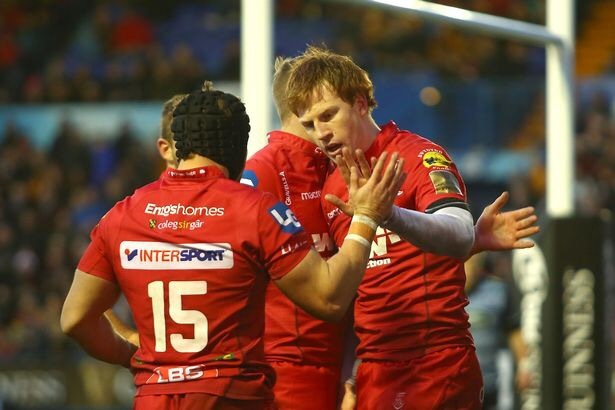 In front of a sell-out Arms Park it was a disappointing finish to the year after dominating large parts of the game. Danny Wilson had been able to welcome back a number of players from the treatment room, with Rhys Gill named in the starting line-up, while Kris Dacey, Dillon Lewis, Ellis Jenkins and Alex Cuthbert were named amongst the replacements. There was late disruption for the team though, as Seb Davies withdrew from the squad through illness, with George Earle stepping up to start and James Down taking a seat on the bench. It would be Earle who offered Cardiff Blues the chance to take the lead in the first 10 minutes, as his big fend on Tadhg Beirne offered front foot ball, only for it to be killed by Josh MacLeod going off his feet at the breakdown. Gareth Anscombe kicked the penalty from in front of the posts with ease. There was an earlier than anticipated return to action for Ellis Jenkins after the next phase of play, when an inconspicuous piece of play resulted in Nick Williams’ head colliding with Leigh Halfpenny’s knee, ruling the big number eight out for the rest of the game. 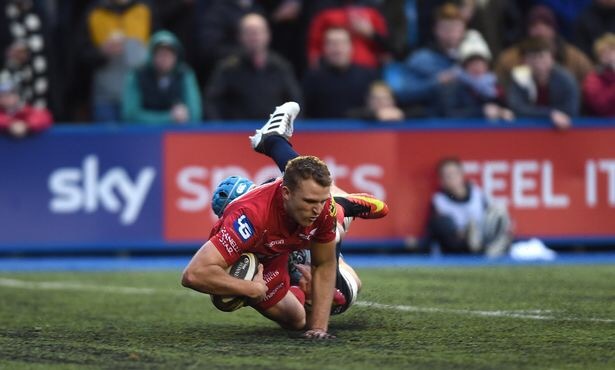 The early part of the game was dominated by the story of two set pieces, as Cardiff asserted dominance over the driving maul, but Scarlets had the upper hand at the scrum. Unfortunately for the hosts it would be the latter that saw the first try of the match. Scarlets turned the screw from a scrum in good position just outside the Blues 22, Gareth Davies picked and sniped off the back of it, cutting back on an angle and breaking the line before offloading to Tom Prydie on his shoulder. Halfpenny gladly added the extras. Cardiff Blues replied well though. Josh Turnbull made a midfield break into Scarlets 22, before the visitors infringed. Anscombe kicked to the corner and the driving maul got to work. Matthew Rees was stopped short on the initial hit, but Ellis Jenkins was able to slide over from the second phase, although there was some question about whether he did reach the line or not. 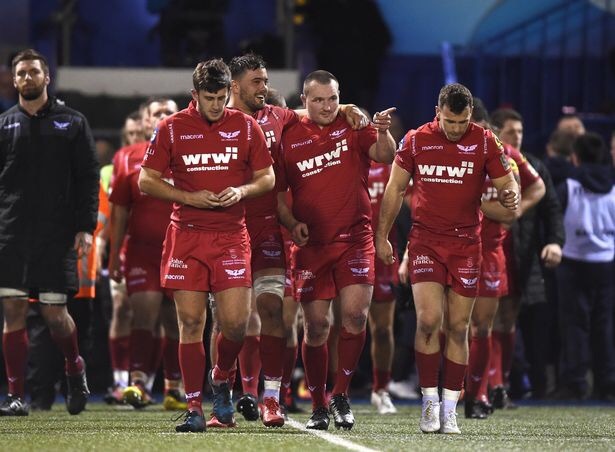 It seemed like the game would continue to yo-yo shortly after as the Scarlets scrum dominance worked on a Cardiff put-in, the ball shooting out the side of the set piece to scrum-half Davies for an easy run-in. However the TMO chalked off the score after James Davies was adjudged to have interfered with the ball while still bound to the scrum. 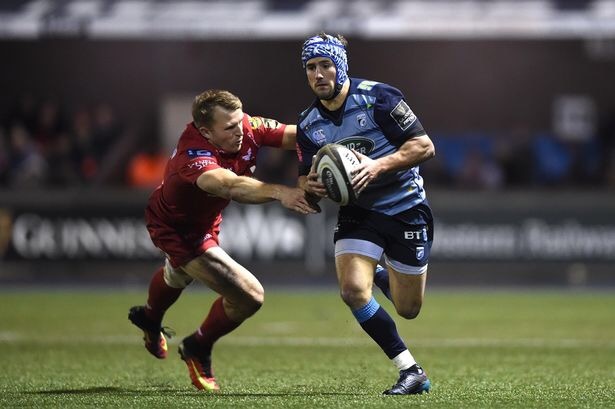 After two excellent lineout turnovers from Josh Turnbull and George Earle, Cardiff Blues were able to extend the lead to four points thanks to another Gareth Anscombe penalty when Scarlets crept offside in their 22. The home side continued to dominate possession and territory throughout the final 10 minutes of the first half, but progression was hindered by handling errors from Willis Halaholo and Tom James, before Matthew Rees wasn’t able to capitalise on a half-break down the left wing. A final chance to put points on the board saw Anscombe produce an excellent offload for Olly Robinson, however the flanker was ever so slightly ankle tapped on his way to a line break and spilled possession as he hit the ground. After the break it was the Scarlets, with a slight advantage from the wind at their backs, who made the running early on. 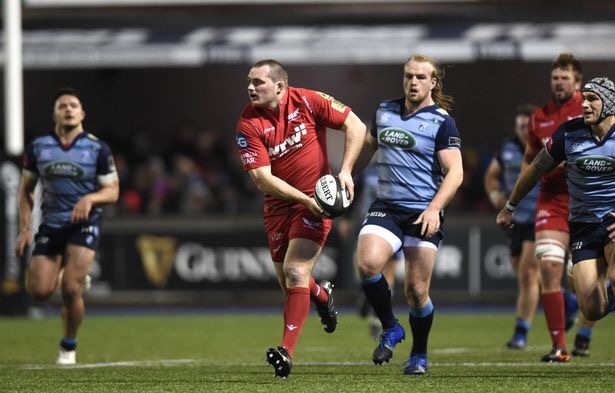 A multi-phase attack saw the visitors move into the Cardiff Blues 22, although it seemed the ball would be turned over when Rey Lee-Lo latched on at the breakdown and Scarlets failed to release. Referee George Clancy decided to ignore the successful jackal though, and three phases later the visitors got lucky as Paul Asquith lost the ball in contact, only for it to roll straight into Rhys Patchell’s hands and the former Blues fly-half rolled Morgan’s tackle to cross the try line. For 10 minutes the game ebb’d and flowed without either side really threatening the try line thanks to errors from both sides and some excellent defensive work from Rey Lee-Lo to hit Hadleigh Parkes and secure a turnover. From that penalty Anscombe kicked the ball into the corner, and although the driving maul was stopped short, Tomos Williams was able to try and wriggle over from close range. The TMO ruled this one out on this occasion though as the scrum-half couldn’t quite reach the whitewash. Cardiff Blues retained possession with the put-in at the five-metre scrum, and Tom James went close from first phase ball, but the home side could not break down the Scarlet wall until eventually the attack came to an end in suspicious circumstances as James Davies turned over the ball after an obviously side entrance at the ruck. Scarlets relieved the pressure from the resulting scrum and gained some ground, however luck was not on the side of the home side at CAP on New Year’s Eve as another terrific defensive read from Lee-Lo saw him make an interception with open ground in front of him, only to trip and fall as he started to speed away. 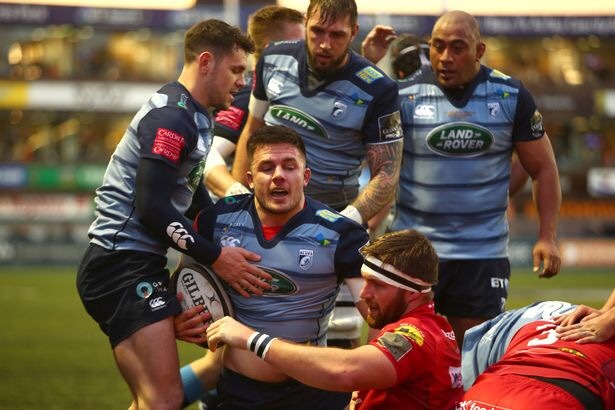 The final 15 minutes of the game were a story of Cardiff Blues attempts to get the crucial score that would likely result in a victory, only to be thwarted by a well organised Scarlets defence, and some questionable refereeing decisions. A first knock-on from Prydie was very close to being deemed as deliberate, but only a scrum was awarded on the left wing, before Tadhg Beirne was penalised for a deliberate knock-on on the edge of the Scarlets 22, and was perhaps lucky to escape a yellow card as a promising attack developed outside him. However the major talking point was the decision to award a forward pass when Jarrod Evans, on for Anscombe at fly-half, put Lee-Lo through a gap and into the red zone. The reaction of the players told you all you needed to know as television replays didn’t go to prove Ian Davies’ call exactly. With 73% possession and 71% territory it was a disappointment to only get 11 points on the board, especially with the firepower that we possess in our back line. Positives can be taken from the hard yards made and ball retention, however the penetration was not up to scratch. Hindsight is a wonderful thing, however, for two reasons. Firstly the team selection should have included Garyn Smith or a similar direct runner in midfield to compliment the skills of Lee-Lo or Halaholo. When the two click they are unstoppable, but more often that not this season it has not come off for them, and this was an occasion it did not work. Secondly there was a very kick-able penalty in the last 10 minutes, which Cardiff opted to kick to the corner. A kick at goal would have brought the teams level and perhaps ultimately resulted in the game ending in a draw, but at the time the ambition shown to go for the try was a positive move. Despite the disappointment brought on by the final score, there were definitely more plus points than negatives to take for Danny Wilson. 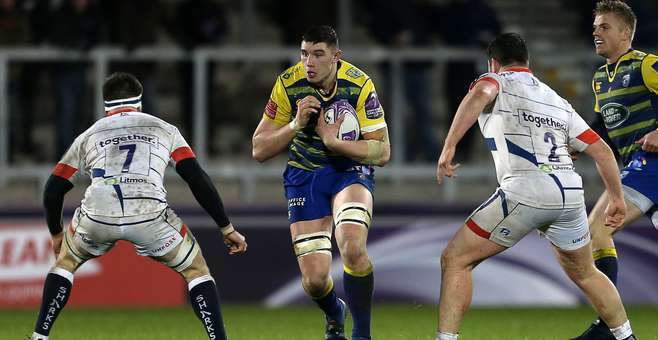 It seemed that each player returning from injury came through unscathed, although there will be a concern over Nick Williams with the Ospreys game less than seven days away. Effort and commitment wise there were no questions over the players, who plugged away for 80 minutes in an attempt to get a win over the reigning league champions. Finally, ahead of the third Welsh derby next week there is momentum to be taken in the way Cardiff dominated the game. With a few tweaks the attacking game will be back to it’s clinical best, and it’s unlikely to come up against a defence as organised as the Scarlets were on New Year’s Eve. Ultimately, the result against the Ospreys will determine just how Blues fans should feel about this game. Win at the Liberty Stadium and it’s a very successful period. Lose, and it’s suddenly us on the back foot. Get down to Swansea on Saturday if you can, the boys need all the support we can offer them. Come on Cardiff!! Thought the loss of Nick Williams was crucial. Couldn’t believe James Davies got M o M.
Big blow losing Nick, although we still should have had enough in the team to get the job done. James Davies is the easy choice for MOTM these days!